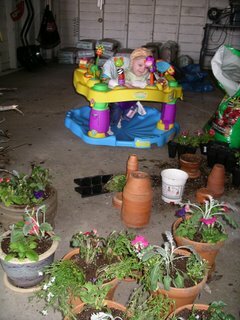 Today I was planting flowers for my container garden that will go on our patio we are putting up this weekend. Little Bo Peep woke up from her nap so I brought her outside to help me. 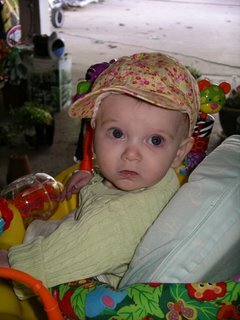 She was watching me so I started telling her how to pot flowers as I was potting. She sat there and watched me the whole time listening and learning. I guess the kiddy gardening kit I bought on sale at JoAnn's will come in handy next summer! I got that picture for you, but I don't think I have your address anymore...drop me an email with it, and I will be sending it in the mail this week.